← Dem Rassismus entgegentreten ! On August, 17th, the people from Lampedusa Village Berlin made a demonstration in solidartity with their sisters and brothers in Hamburg. The history of them: They have lived and worked with their families in Libya, many on the oil fields. In Libya they have had quite good livelihood conditions. In March 2011, when the war of the NATO with agreement of the UN and the European Council started, their working places, homes and secure livelihood conditions had been destroyed. The rebels started to attack them too and many of the so called Sub Saharians have been killed by the bombs or the rebels. So they had no other chance to survive as to flee from Libya by boats. Many of them died on this dangerous journey, but some of them reached Lampedusa and have been in one of the terrible lagers there. After spending a lot of time there, the Government Officials of Lampedusa gave them Italian papers and sayed to them: „Go away from Lampedusa / Italy to other European countries.“ Now they have being traveled and are in all countries of Europe, in Germany too. Currently, after all the pain, they demand the right to stay in Europe and to work. The demonstration in Berlin ended on the place of the current „Festival against Racism“ in Berlin with a speach against militarism and for peace of Bashir. Thx to Bashir for that! We worked and lived in Libya, a country on our African continent that gave us the possibility of a secure existence. We never had the intention to come to Europe. Because of the NATO-intervention, officially for the „protection of the civil population“, the war escalated and we lost everything. Many people died. Most of us came on overcrowded boats over the Mediterranean. Many people lost their lives on the way. This is how we got to Lampedusa. The European Union and the member states of the NATO are all responsible for our destiny. We united and demand a political solution and the recognition according to § 23 Aufenthaltsgesetz (residence law). We would not be here if it wasn’t for the war in Libya and the catastrophic conditions of human rights for refugees in Italy. We are exhausted and worn out from a long involuntary and horrible journey. We seek for an end of the refusal of our right to live. Solidarity with the movement and demonstration LAMPEDUSA in HAMBURG! 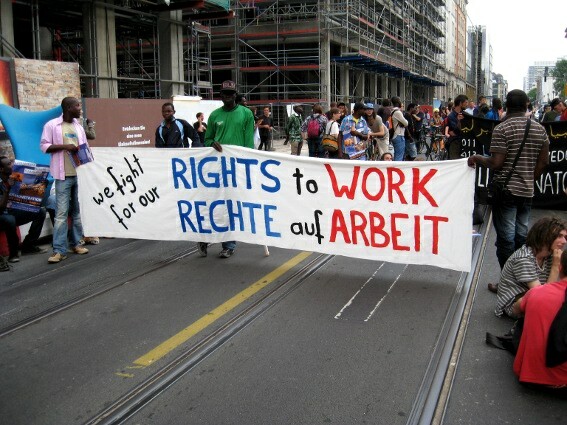 We demand the right to work and homes! So there should be no doubt, that Germany should take the responsibility for the refugees of Libya and for giving them asylum with the full right to work ! The law, which should be applied to all the struggling refugees, who fleed out of countries of terror, dictatorship and war. The reason: The German Government with its secret service and the German industrial-military-complexe have their interests and foreign policy ‚fingers‘ in plenty of countries and conflicts zones. (1) The supreme Land authority may order – on humanitarian grounds or in order to protect the political interests of the Federal Republic of Germany – that a residence permit is to be granted to foreigners from specific states or to certain by other means defined groups of foreigners. The residence permit entitles the holder to pursue an economic activity.In order to ensure a nationwide uniform approach, the order shall require the approval of the Federal Ministry of the Interior. Aufenthaltsgesetz § 23; Aufenthaltsgewährung durch die obersten Landesbehörden; Aufnahme bei besonders gelagerten politischen Interessen. (1) Die oberste Landesbehörde kann aus völkerrechtlichen oder humanitären Gründen oder zur Wahrung politischer Interessen der Bundesrepublik Deutschland anordnen, dass Ausländern aus bestimmten Staaten oder in sonstiger Weise bestimmten Ausländergruppen eine Aufenthaltserlaubnis erteilt wird. Die Aufenthaltserlaubnis berechtigt zur Ausübung einer Erwerbstätigkeit. Zur Wahrung der Bundeseinheitlichkeit bedarf die Anordnung des Einvernehmens mit dem Bundesministerium des Innern. Dieser Beitrag wurde unter Flüchtlingsproteste, refugee strike abgelegt und mit asylstreike, Asylstrike, boatpeople, countries of europe, dangerous journey, Lampedus, lampedusa italy, Lampedusa people, Lybia, migrants on sea, no deportation, nytimes, refugee struggle, refugees, right to work, Sub Saharians, War verschlagwortet. Setze ein Lesezeichen auf den Permalink.